Malta has made headlines quite often lately and you have probably heard about Malta’s vision to become a blockchain island. Malta — a Southern European island country consisting of an archipelago in the Mediterranean Sea have strong plans to create a crypto-friendly environment and has taken important measures to attract many blockchain and crypto-related businesses to its country. 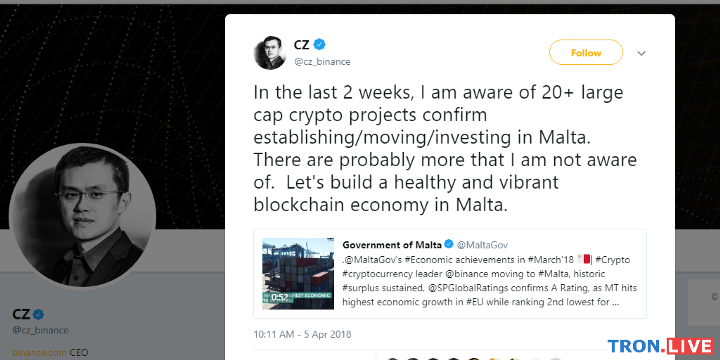 Many large crypto companies including Binance (the world’s largest cryptocurrency exchange by volume) has already made public announcement about moving operations to Malta. 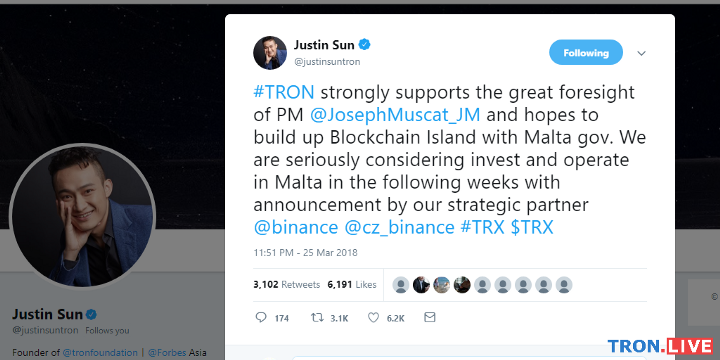 Justin Sun (CEO & Founder of TRON Foundation) also made a tweet showing strong support to the great foresight of Malta’s Prime Minister Joseph Muscat and hopes to build up Blockchain Island with Malta government. TronLive had a chance to engage with Silvio Schembri, the Junior Minister for Financial Services, Digital Economy and Innovation within the office of the Prime Minister of Malta. Since this interview consists of many acronyms, TronLive has prepared a list of acronyms that appeared in the text for easier reference. R&D — Research and Development. Systematic investigative activity combining both basic and applied research a business conducts to improve existing products and procedures. It may also lead to the development of completely new products and procedures. AML — Anti Money Laundering. A set of procedures, laws and regulations to help detect and report suspicious activity, and to stop the practice of generating income through illegal means. DLT — Distributed Ledger Technologies. More commonly known as the blockchain technology refers to the technological infrastructure and protocols that allows simultaneous access, verification and record keeping in an immutable manner across a network. It is all about the idea of a decentralized network that is not controlled by a single entity and doesn’t have a single point of failure. VFA — Virtual Financial Asset. Malta’s financial instrument test will determine how a DLT asset should be classified. The first stage test whether a particular DLT asset qualifies as a Virtual Token (VT). If it is not concluded that the asset is a VT, the second stage would determine whether the DLT asset would qualify as a financial instrument. Should a negative determination be reached again during this stage, then the DLT asset would qualify as a Virtual Financial Asset (VFA). MFSA — Malta Financial Services Authority. The single regulator for financial services in Malta. The Authority is a fully autonomous public institution and reports to Parliament on an annual basis. ICO — Initial Coin Offering. Similar to an IPO in the non-crypto world. Startups offer their own token in exchange for Bitcoin, Ethereum or altcoins, usually at a lower rate than what it will be on the open market later. IMF — International Monetary Fund. An international organization headquartered in Washington, D.C., working to foster global monetary cooperation, secure financial stability, facilitate international trade, promote high employment and sustainable economic growth, and reduce poverty around the world. AI — Artificial Intelligence. Intelligence demonstrated by computer systems or machines which are able to perform tasks that normally require natural human intelligence or intelligence of other animals. IoT — Internet of Things. A network of interrelated computing devices, mechanical and digital machines, objects, vehicles, home appliances, animals or people that are provided with unique identifiers and the ability to access the internet and transfer data over a network without requiring human-to-human or human-to-computer interaction. TronLive: Nice to meet you, Silvio Schembri, as our introduction to Prime Minister of Malta — Joseph Muscat earlier, we are TronLive — a TRON community with the ultimate goal of connecting people together and bringing informative and accurate information to the greater audience. We understand from the Prime Minister’s tweet that Malta aims to become a “global trailblazers in the regulation of blockchain-based businesses and the jurisdiction of quality and choice for world class fintech companies”. TronLive have been forwarded by the Prime Minister to you. We know that you are the Parliamentary Secretary of Malta and you are the Junior Minister responsible for the blockchain policy in your country. Can you give the audience a brief introduction of yourself and let us know what you handle in this new blockchain policy? My responsibilities, under the portfolio of the Prime Minister, are quite broad. They involve financial services regulation, digital economy, and innovation. Again, each one of them is multifaceted, for example innovation involved R&D but also new areas such as space. In the past, financial regulation, digital economy and innovation used to form part of three different ministries, however, there is so much interaction between them that the need for a high level of synergy was definitely felt. Taking the example of blockchain based business, it touches strongly on all three: it is innovative, it will be the backbone of the digital economy, but it will also have huge ramifications on the financial services in terms of fintech and regtech. Certainly, one of our most visible delivery is our achievements in the area of blockchain. The term ‘global trailblazers’ is fast becoming a reality and we are closing in to have the regulation in place. As part of our preparation of the legislative framework, we held numerous meetings with the international industry and our idea and vision was so powerful that major operators have already publically declared their intention to start operating from Malta. TronLive: TronLive would like to share your great vision of making Malta a blockchain island to TRON and TronLive community members, supporters of the crypto space and to the rest of the world. Can you give us a brief overview of this regulatory framework for cryptocurrency and what does it cover? Our regulatory framework can be described as being conductive to business while offering high level of requirements in terms of international obligations such as AML as well as protection for the consumers in terms of technology. In my view, the latter is very important and is something that serious operators are looking forward to it. Basically, we will be putting forward three Bills: the first Bill will set up a new authority that will be certifying technological arrangements, the second Bill will present the legal framework around which this certification while the third Bill to be known as Virtual Financial Asset (VFA) Act, is piloted by the Malta Financial Services Authority (MFSA), and will be regulating virtual currency, ICO, exchanges and all services providers. The Bill under MFSA will be based on a principle-oriented approach and importantly will be making a distinction between a normal financial instrument and a ‘digital’ non-financial instrument. This, I believe, is central to our objective as we intend to put in place robust and transparent legislation without going over-board with regulation and stifle innovation. TronLive: On March 23 this year, Prime Minister Joseph Muscat welcomes Binance to Malta. Malta has the vision to become the blockchain island and Binance, the world’s largest cryptocurrency exchange by traded value, is setting up operations in Malta. After Binance CEO & Founder, Zhao Changpeng (CZ) met with you, CZ and his team are impressed by the logical, clear and forward-thinking nature of Malta’s leadership, and are convinced that Malta will be the next hotbed for innovative blockchain companies. This is quite an exciting news to the crypto communities. Can you give us some hints of what’s coming up? The news by Binance was certainly very welcomed and sent a powerful message across the globe. Having the CEO and Founder of the large cryptocurrency exchange making such declarations clearly helped to put interest in our work top on the agenda of many operators. Basically, we shared with Binance our vision as outlined in the consultation document that we published back in February together with details on the proposed VFA Bill. The VFA Bill will be defining financial instruments as those DLT assets qualifying as financial instruments as defined in the Financial Instruments Directive, whereas virtual tokens as the utility tokens in their purest form, i.e. having no utility, value or application outside of the issuer’s DLT platform. I might also say that the proposed VFA Bill will introduce a transitory period for both issuers and service providers in order to enable such persons to comply in full with the requirements emanating from the said Bill, thus ensuring a seamless transition and preventing any disruptions in the financial services cluster. TronLive: On March 25, Prime Minister Joseph Muscat retweeted Justin Sun’s (CEO & Founder of TRON Foundation) tweet suggesting a welcome to Malta as well. Let us give you a brief introduction to TRON. TRON is a decentralized content entertainment platform based on blockchain technology and has the ultimate goal of decentralizing the Internet. It is currently one of the cryptocurrencies with the largest crypto communities in the world. 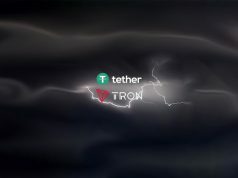 Do you see TRON as a useful cryptocurrency for Malta? While we are open to all type investment, we are also very careful to attract the right kind of investment. We aim to have serious operators with a vision that compliments ours. TRON is one of them. What is particularly interesting about it is the focus on smart-contract. We believe these will play a central part in the eco-system and will revolutionise entire business models. TronLive: Becoming the blockchain island is indeed a great vision and it is quite surprising to see government to have an open hand to cryptocurrency. After this article is published if other blockchain/crypto companies around the world have interest in operating in Malta, can you let us know here what are the general requirements? Also, what advantages are there for blockchain companies to operate in Malta? As you rightly stated, this Government has always adopted an open minded approach to this new disruptive technology. It is fair to say that up to a few months ago there were strong international current against this approach. However, one can easily see that things have changed. Recently, we had several declarations in favour of regulation, the latest coming from non-other than the head of the IMF, with Christine Lagarde being quoted as stating that crypto-assets hold the potential to revolutionise the world of high finance by making it faster, cheaper and safer. So the fact that we moved earlier, faster and despite earlier resistance shows that we are convinced in what we are doing. This gives us a competitive advantage as it shows that we strongly believe in its potential and operators can have peace of mind and certainty, important factors in business decisions. Besides this, we champion ourselves as being very pro-business and do our best to support potential investors. Malta also has other distinctive strong points that should work in favour of companies eyeing to operate in Malta. Let’s not forget the strong presence of i-gaming sector and the financial services — both offering complimentary synergies. A further important factor are the various schemes in place, like the highly qualified persons rules, that will facilitate the inflow of skills. 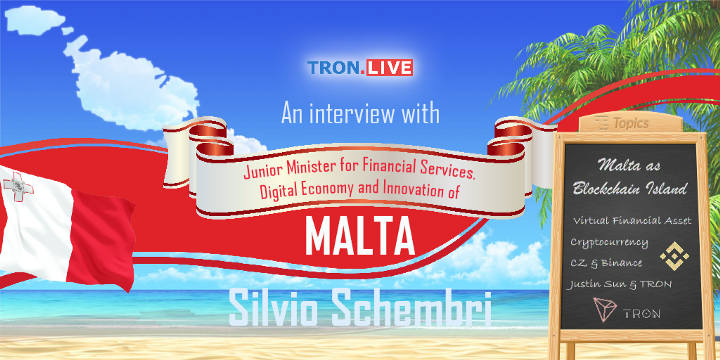 TronLive: Lastly, let’s talk about Malta. Having such innovative leaders that are pro-blockchain, and is actively building a supportive regulatory and technical infrastructure for its country is awesome. Other than cryptocurrency exchanges operating in Malta, do you also encourage the use of cryptocurrencies in everyday life? For example, do you envision people in your country being able to use cryptocurrency like TRX one day to buy a movie ticket and watch movie, or spend it on other product and services? What’s your view on how Malta will be like in the next 1, 2, 5 years? It is rather difficult to pinpoint exactly how this will evolve. There are various school of thoughts with some viewing crypto as a new form of asset while other convinced that they will evolve further to play a central role in everyday life. As a Government, we believe these will be predominately business decisions, driven by technological advancements and market needs. However, our proposed legal frameworks is open enough to cater for both of them. What is sure is that this technology will change the way business and third parties interact with each other both in terms of transactions as well as ownership of information. On a more macro-level, I see this sector growing steady over the coming few years, possibly becoming the most important sector in our economy in terms of value added and employment. One must also keep in mind that our proposed legislation can easily evolve to cater for AI and IoT. So, pretty exciting times ahead. TronLive: It sure sounds very exciting Silvio. In the near future, we will see blockchain technologies reshaping the way work is done, smart-contract giving a helping hand to ease the repetitive process, and mass-adoption of cryptocurrencies which plays an increasing role in our daily lives. Furthermore, integrating AI and IoT to the field as you mentioned will bring a huge potential to transform healthcare, transport, manufacturing, and even our domestic chores in the future. It has been a great pleasure for us to chat with you about blockchain and Malta’s innovative policies in working with and accepting cryptocurrencies. 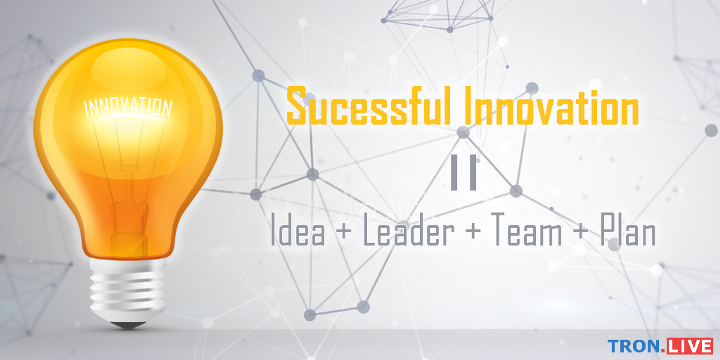 TronLive believes that a successful innovation should consist of the following elements — idea, leader, team and plan. It looks like Malta already has all of these ready so the vision of Malta becoming a Blockchain Island is quickly becoming a reality. 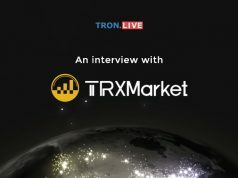 TronLive thank you for your time to get our questions answered. Thank you Silvio Schembri, Prime Minister Joseph Muscat, Nigel Vella, Keith Abela and the rest of the team for your work on the blockchain field!